How to use Amla Hair Oil for maximum benefit? Choosing the right hair oil is as important as applying it regularly. Amla oil not only helps in keeping the scalp clean but also helps in promoting the healthy hair growth and protects hair from drying and premature greying. Amla Oil can be used like any other oil for scalp treatment and deep conditioning. Here are some of the basic tried and tested recipes for specific treatment. d. Add all the ingredients and heat it till the kadipatta turns black. Switch the gas off once the smoke is coming out. Once it is cooled down, massage on your scalp. Leave it overnight. e. You can apply this two times in a week for better results. It maintains the natural colour of your tresses and gradually you will notice the reduction in graying of hairs. f. Mix all the ingredients to make the thick paste. Apply on scalp, especially on the bald patches. Leave it for 30 minutes. Wash with your regular shampoo and conditioner. This remedy is very good to get back the lost hair, treat the damaged hair and thereby making it stronger. d. Sock dried amla and amla oil in the water overnight. Use it as final rinse to nourish your hair from within. It is the natural conditioner for your hair and proved to be successful to treat the dry and rough hair. e. Grind Tulsi leaves with little water. Add it in to the rest of the ingredients. Warm it and apply evenly on your scalp. Cover it with shower cap. Wrap it with hot towel for 30 – 60 minutes and wash with shampoo and conditioner. 1) Dry your hair and scalp completely. Make sure there is no sweat on your scalp. 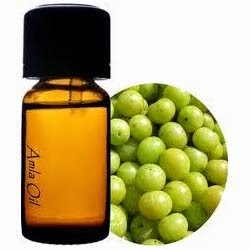 2) Depending upon the length of your hair, talk amla hair oil in the bowl. 3) It can be used as hot oil or cold oil. Soak fingers in the oil and gently massage onto your scalp with your fingertips. 4) It is beneficial to keep it overnight and wash it with your favourite shampoo next day. If you are short of time, apply oil, wrap it with hot towel so as the oil gets absorbed quickly. After 30 – 45 minutes, you can proceed with the hair wash.
Oil like coconut oil / mineral oil / almond oil / sesame seeds oil are taken as base to make the amla oil. Usually Amla Fruit is either directly soaked in the base oil as mentioned above or dried powdered of amla fruit is infused in the base oil for sometime and the resulting oil is the amla oil. Here I have mentioned couple of recipes that can be prepared at home easily.  Cut Amla fruit into pieces and dry it out in sun.  Wait till the powder turns brown. Stir continuously. Ensure that the mixture does not turn black or burn.